Mrs Hoan Vo works in the Community Office of the Center for Preventive Medicine (CPM) in the Yen Thanh district of north Vietnam, with a population of 280,000 people. A former mid-wife, Mrs Hoan oversees community-related issues (e.g. work safety, social diseases, water and sanitation) in this large district where more than half of the population still lack hygienic latrines. Because of these demographics, Yen Thanh was selected for implementing sanitation marketing under the Water, Sanitation, and Hygiene Scale Up Project (WASH-SUP) which provides government officials technical assistance from iDE with funding from the Australian government. After 6 months with the project, Mrs Hoan had changed from a project skeptic who lacked confidence in the approach to a strong agent of change who is a champion for latrine promotion to her fellow CPM colleagues. She has proactively identified potential latrine suppliers/ring producers and then linked them to the right customers. She has traveled frequently to the field to speak with families lacking hygienic latrines. She has attended numerous village meetings to promote hygienic latrines and assisted local commune health staff in delivering hygiene messages. Her efforts have paid off. 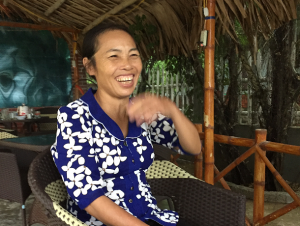 Yen Thanh is leading the five districts with 2,000 hygienic latrines installed since the beginning of the project.